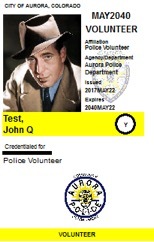 All Volunteer activities require an Aurora Police Department-issued Photo ID card. You will not be allowed to participate without one. The cards are issued free of charge. This is an exact process that has a lot of steps and takes time! Please plan ahead! 1) BEGIN THE PROCESS WITH CLARICE FIRST. You cannot go to Police Headquarters without contacting Clarice first because they will not have the required paperwork on file and therefore cannot issue you an ID card. They will turn you away and you will have wasted your time. You must begin the process by contacting Clarice at clovett58@gmail.com so that she can get the required information from you and submit a Volunteer ID card Application to the Police Department. 2) WAIT FOR A RESPONSE FROM CLARICE. Again, you cannot go to the next steps until you receive acknowledgement from Clarice that she has turned in your application to the Aurora Police Department. Without an application the Police Department has no idea why you are visiting them and they will not issue the Volunteer ID card. 3) WHEN CLARICE ADVISES YOU THAT THE PAPERWORK HAS BEEN TURNED IN, THEN GO TO HEADQUARTERS OF THE AURORA POLICE DEPARTMENT. Read this section so you know where, when and who to talk to regarding the Volunteer ID card. There are only certain times and dates available for Volunteer ID card issuance. No, you may not make arrangements outside these dates and hours. Your card will be issued on the spot and will be good for five (5) years. This is a Photo ID card that will be around for five years so make sure you are wearing what you want and appear exactly how you want to be seen for five years. You are responsible for making sure you have a current and up-to-date ID card. We will not send renewal reminders. First, look at the top right of your existing ID card above VOLUNTEER and you will see a month and year. You do not need to renew unless the current month and year are past those listed on your current card. Clarice IS NOT INVOLVED in your renewal since your paperwork is already on file with the Aurora Police Department. Your card will be issued on the spot and will be good for five (5) years.